SwordSearcher 8.3 is now available! In addition to some great new library content, the big update in this release is enhanced Audio Bible support. There are now several narrations supported by SwordSearcher’s audio Bible integration and you may link in as many audio Bibles as you have on your hard drive. 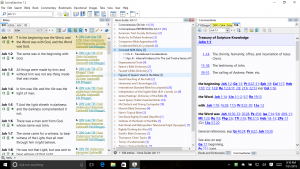 SwordSearcher has supported the integration of an audio Bible for several years, but this functionality has been significantly enhanced for SwordSearcher 8.3. Alexander Scourby, KJV, AMG Publishers. Alexander Scourby, KJV, Hendrickson Publishers. Max McLean’s Listener’s Bible, KJV, Fellowship for Performing Arts. David Cochran Heath, KJV, ChristianAudio. Dan Wagner, KJV, Talking Bibles International. Faith Comes By Hearing Dramatized KJV. Note that SwordSearcher does not come with an audio Bible. You may integrate any of the above audio Bibles into SwordSearcher once you have obtained them from their publishers or retailers. Please see the audio Bible page on the website for a complete list of supported audio Bibles and where you can obtain them. You may now configure an unlimited number of audio Bibles at the same time. Switching between integrated audio Bibles is easy and done with a simple selection in a list. Audio playback speed can be adjusted to make it slower or faster based on listening preference. The core audio system has been replaced and updated to work with a wider variety of source audio files. Audio Bible configuration/selection is accessible on the main File menu or with Shift+Ctrl+A keyboard shortcut. Added visual feedback for clicking on a verse widget or margin link. Word Trees now remove hyphens from hyphenated words. This allows Word Tree searches and links to work consistently regardless of hyphenation setting in Preferences. Verse Guide panel will automatically rebuild its content after saving changes to a user module entry. Improved parsing of hard-coded verse reference links in user module entries. Fixed issues related to “Remove optional hyphenation” option. Fixed some tab display issues that could occur after renaming or deleting user modules. Fixed a condition where the user editor would not allow saving until more changes were made after switch to Design mode. Fixed incorrect counts and ratios in Bible Search Result Info and Stats for Verse Match Count by Book. Fixed: Renaming a user module could orphan its keyboard shortcut. Fixed a condition where user module editor Insert Table dialog could get hidden behind the editor. Other various minor fixes and optimizations. I am very happy to be able to announce a major new release. SwordSearcher 8 is the result of a significant effort and it’s great to finally be able to present it to you. Please see below for a summary of the new features and be sure to watch the short video demonstrating a few of them. All of your upgrade questions are answered here. KJV-TSK: The King James Bible with integrated in-line cross-references from the Treasury of Scripture Knowledge. The extremely useful Treasury of Scripture Knowledge (expanded, with over 800,000 cross-references) is now available in an integrated form in this new Bible panel tab. Hundreds of thousands of cross-references are now presented in-line from notation in the Bible text. It is no longer necessary to go to a separate commentary panel to use the cross-references. A very complete dictionary from the early 20th century. This digital edition organizes identical headwords under a single entry. Not counting plurals or multiple word forms, there are over 120,000 words defined in over 98,000 entries, with over 48,000 cross-linked entries and over 4,300 linked references to Scripture. This does not replace the 1828 Wester’s module — both are included. Integrated Bar Graph for Bible search result verse lists. 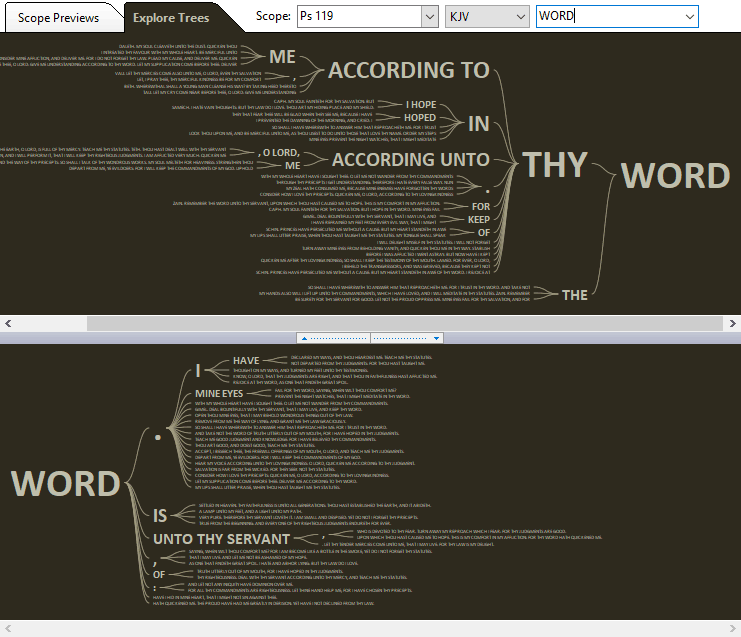 Concordance View mode for Bible search results in Verse List Panels. New KJVSL (and SRVSL) layout: Reverse interlinear. Comprehensive support for high-DPI and 4K+ displays. Assign your own hotkeys to your favorite modules with custom module shortcuts. Current users click here for upgrade info. Not yet a SwordSearcher user? Order here. A small, free “hotfix” update is available for SwordSearcher 7.2. This update includes the fixes from the previous hotfix updates, so there is no need to install the previous hotfixes if you haven’t already done so. This update is recommended for all SwordSearcher 7.2 users. After running the update, your SwordSearcher version will be 7.2.1.6. If you are running a version older than 7.2, please go to the Upgrade FAQ page instead. A hotfix is a small update that fixes specific bugs found after the software was released. What is fixed in this update? Fixed a condition where corrupt module file data on the hard drive could prevent SwordSearcher from starting. Fixed bug that could cause SwordSearcher to crash when saving a user module entry. Fixed up/down keys not scrolling text on some systems. Fixed rare crash bugs relating to live spell checking in editor. A few subtle corrections to rendering borders in some windows. Fixed condition where program could freeze when deleting user module. Fixed incorrect daily reading time division for custom reading plans based on daily time desired with certain types of reading segments. Fixed some rare potential crash bugs. How do I get the Hotfix? After installing the update, your version number will read 7.2.1.6. Again, This hotfix update is for users of 7.2 only. Thank you! A small, free “hotfix” update is available for SwordSearcher 7.2. This is the third hotfix for version 7.2 and addresses a bug that could cause SwordSearcher to crash when saving a user entry. This update includes the fixes from Hotfix 1 and 2, so there is no need to install the previous hotfix if you haven’t already done so. After running the update, your SwordSearcher version will be 7.2.1.4. Fixed some other rare potential crash bugs. After installing the update, your version number will read 7.2.1.4. A small, free “hotfix” update is available for SwordSearcher 7.2. This is the second hotfix for version 7.2 and addresses a few more minor problems that have been reported recently. This update includes the fixes from Hotfix 1, so there is no need to install the previous hotfix if you haven’t already done so. After running the update, your SwordSearcher version will be 7.2.1.3. After installing the update, your version number will read 7.2.1.3. A few days ago, Microsoft began rolling out free Windows 10 upgrades to the public. I’ve received several emails asking if SwordSearcher works on Windows 10. The current version of SwordSearcher (7.2) has been tested on preview releases of Windows 10 over the course of the last several months, and tested with the final public release as well. There are no known problems using SwordSearcher 7.2 on Windows 10. So if you want to upgrade to Windows 10 and just want to be sure that SwordSearcher will continue to function, there’s nothing to worry about. If you do an in-place upgrade and keep your apps and settings, SwordSearcher will continue to “just work,” your settings will stay the same, and any user books and commentaries you have will still be there. Please note that only the current release of SwordSearcher is supported on Windows 10. Previous versions may not be completely compatible. 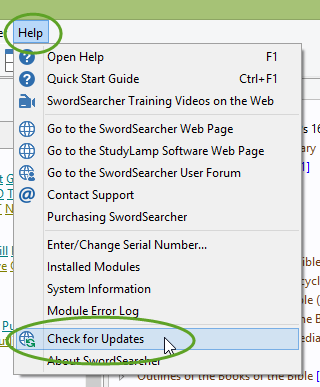 If you are not sure what version of SwordSearcher you have, or want to know how to upgrade, please open SwordSearcher, go to the Help menu, and select “Check for Updates.” Or head on over to the Upgrade FAQ. A small, free “hotfix” update is available for SwordSearcher 7.2. After running the update, your SwordSearcher version will be 7.2.1.2. I am pleased to be able to announce the release of SwordSearcher version 7.2. If you’re already a SwordSearcher user you can read upgrade details here. Here’s a details list of what’s new in 7.2 (since 7.1). The complete revision history is also available here. Teach Us To Number. Every number mentioned in Scripture, from zero, through fractions, to infinity; all organized in a thorough concordance and easy to reference. By J. G. Williams, Copyright 2012. A Bible-honoring history of the world, from the creation of man through 73 AD, organized by year. Expository Notes from the Numerical Bible. Significant speed improvements on main search bar suggestion list population. Significant speed improvements to any phrase searches in library (any module type). This extends to any functions that rely on phrase matching (such as some of the StudyClick pop-up hint windows, etc). Speed improvements to library search result panel text loads with previews taken from very large entries. Book or Commentary quick-search can be aborted. Faster loading of panels from global “go to verse” setting, etc. New “expand to chapter” toolbar button in the commentary panel automatically shows all entries from the chapter. This is an easy way to read though commentary text on a whole chapter. Manual entry of verse ranges in the commentary panel entry selector is also possible (up to a full chapter can be shown). Highlighted module tabs in commentary panel work with expanded multi-view as well, and switching between commentary tabs maintains the current verse range. For official (Deluxe Edition Library) commentary modules, multi-entry view is optimized to remove “see comment on, commentary continues on, etc” placeholders. Improvements to commentary entry selector and drop-down list scroll position, especially when viewing an empty entry in the commentary panel. Commentary entry title list honors custom abbreviations. “Psalm” is used instead of “Psalms” unless it is a reference to the title of the entire book. Reference tags omit chapter number (1) for books with only one chapter (Jude, etc). Added Superscript number option to copy/export formatting styles i, j, k, and l.
Added “All Italics” option to copy/export formatting; forces the entire output to be in italics. Added support for Hendrickson Scourby DVD and CD audio file names AND verse-level synchronized playback. See help file for details on linking MP3 Bibles in SwordSearcher. You can purchase this MP3 Bible on Amazon or from Hendrickson. __MACOSX folder filled with duplicate file names is ignored now. It’s no longer necessary to manually remove those superfluous folders before linking the audio files in SwordSearcher. 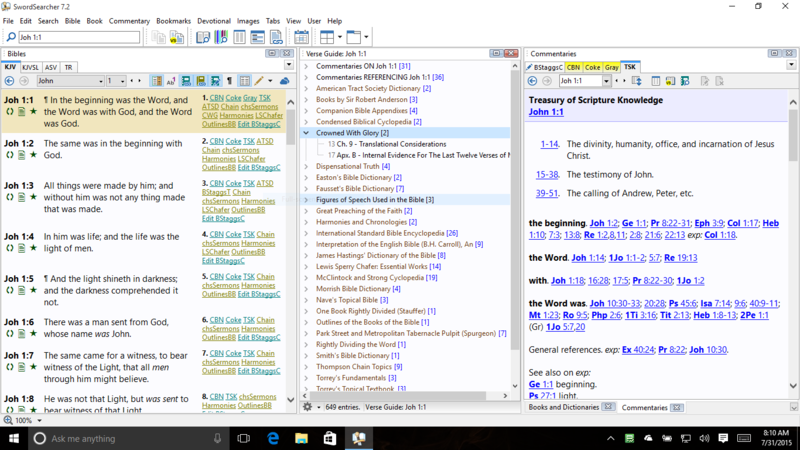 Better choice of scrolling/highlighting method (File, Configure Bible Audio). Added option to deactivate a reading plan (removes it from the daily reading schedule but does not delete the plan or progress.) Deactivated plans can be reactivated or rescheduled. You can create a highly custom plan manually in a text file by putting each day’s reading (verse references) on a line. This text file can be imported as a SwordSearcher reading plan. Select Devotional, Add New Reading Plan, then click the Import Template from File and change the file type to “Daily Reading Per Line Text Files (*.txt)” and open your file. Coverage of the plan will be reported so you can verify that the list of days were correctly interpreted. Reading plan templates can be saved as a day-per-line text file. A reading plan can now be saved as a template even if it is not a template. Text Display Options, Additional Bible Panel Settings: “Bible column spacing,” for users who want less or more white space in the Bible panel. Fonts and Colors: “Underline Links” preference option. Un-check this to turn off the underline which is applied to links by default. Added count of chapters containing matches to Bible Search Result Info and Stats information list. Bible margin edit commentary links show preview (if any). Library search result preview shows “edit” link next to title of editable module entries. Send Link to Editor function restores and focuses the editor. Insert Verse Link dialog more flexible with input recognition. Insert Link to Entry dialog has better entry selector; works as book and commentary panel entry selectors do. Improvements to the verse reference recognition system. Searching for “usward, youward” etc in a Bible module will automatically match the intended hyphenated compound words (“us-ward, you-ward,” etc.). Opening a clone panel with ctrl-click opens the panel at mouse position instead of over “parent” panel when not in auto-dock mode for clone panels. Added Verse List right-click menu option to open verse in clone panel. Reduced memory impact of a full-library search. Fixed small menu lines on high-DPI systems. Fixes related to full library search result display updates after user module edits. Fixed synchronized MP3 audio playback scrolling not working properly on some systems. Fixed design mode editor preventing audio pause/resume with Ctrl+Space. Fixed text panel scroll positions not restoring properly at startup. Various stability and other minor fixes. Minor updates to KJV, KJVSL, SRV, SRVSL, RVG, SGreek, SHebrew, SME, and Easton modules.